We have chosen several Moscow metro stations to help you to make out the beauty of the Moscow “underground palaces”, to admire details of decoration, to estimate beauty and quality of the materials used for stations` finishing, to get into sense of mosaics and bas-reliefs. 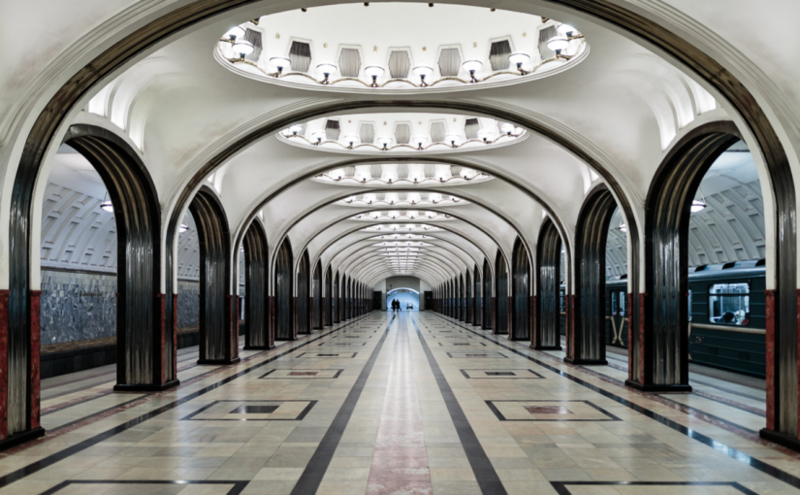 During the excursion you will find out the history of appearance and development of Moscow Metro. You will see examples of stations of different periods. You will understand how change of historical stages and Soviet ideology influenced architecture, technologies of construction and finishing materials: in the 1930th there was the search of new construction decisions; in 1940-50 there was the cult of Stalin personality and memory of the Great Patriotic War; in 1950-60 appeared dethronement of the cult of Stalin personality and fight against the excessive decoration; since the 1980th there was an appearance of a kaleidoscope of the stations decorated absolutely differently: from a mosaic to metal designs in modernist style. Route: Okhotny Riad — Teatralnaya — Ploschad Revolyutsii — Kurskaya (radial) — Kurskaya (circle line) — Komsomolskaya (circle line) — Novoslobodskaya. Meeting point: on the pedestrian bridge in the center of Komsomolskaya metro station (radial). Guide: art historian Maria Nikitina. Cost of the excursion ticket: for group to 9 people 6500 rub. ; to 10-15 people 11 500 rub. ; to 15-20 people 15 000 rub. To each participant the radio-guide for excellent audibility is given. We advise to take your own earphones. It is necessary to have with you a deposit for the radio-guide (1000 rub. each or an identification card).